Please excuse the face looking paler than the neck. The foundation does match but the sunscreen I'm wearing under is reflecting light. I got burnt pretty bad while on vacation so now I don't leave the house without my SPF45 :/ Let me know what you think. I hardly do a full body pic but this is one of my fave summer outfits. I just like to throw on this Ralph Laurent tank dress. And of course to make my curves stand out more I always add a belt. The shoes are prob 2-3 year old, I believe they're from Guess. I checked out MAC's To the Beach collection while I was in the middle of my vacation in Halifax. I met up with Samantha from Cosmetosaur in the mall. She's a sweetie in person, and so very hyper :D Here's a picture of the two of us. She has the coolest green hair and don't get me started on her eyebrows. Ask her for the shades she used on them. I was not really that thrilled with To the Beach. I think it's one of the least inspirational summer collections MAC has done in a while. I wanted to get Firecracker e/s but ended up passing. I figured I wouldn't use it that much and I already have orange and coral shades from MUFE. I loved Thrills l/s, a gorgeous rosy bronze shade which does not look like anything in my stash. I also grabbed Temperature Rising l/l, a beautiful bold orange and perfect for summer. I also got Fleurry of Fun l/g which is a sheer orange with teal glitters. It looks awesome over Thrills actually. When I was the Kittery's outlet in Maine, I visited their CCO as well. I was mostly concerned with buying clothes and shoes so I didn't spend too much time in the CCO. I did get two fluidlines, Blue Peep and Macroviolet as well as Cocomotion pigment. I'm quite happy that I kept both hauls small. There was way too many other nice things to buy and yummy seafood to eat to worry about getting more makeup, lol! What did you guys haul from the Beach? Hey guys! Just a quick note to let you know that as mentioned in few of my posts, I will be away on vacation until June 1st. I won't be blogging until I come back to Ottawa as I'm planing on leaving my labtop at home *gasps*. 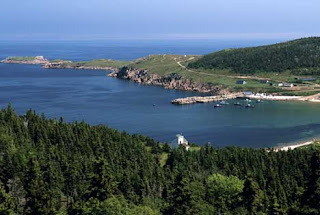 We are going on a road trip to Atlantic Canada and I'm super pumped about it. If you follow me on Twitter, I will be posting quick trip updates on there. Happy Thursday everyone! I'm only one and half work day away from our road trip to Atlantic Canada! I'm hoping that mother nature cooperates and it doesn't rain much. But even so I'm still determined to have a super chill time. For today's poll I wanted to ask you a skincare related question. I'm getting more and more into skincare products lately but there is so much info and products out there that one can easily get confused! If you are in your mid to late 20's, do you use an ante-wrinkling eye cream on a regular basis? See, I don't but I've been told by many sources that I should start before I hit my 30's (I'm 28). Please use the poll on the side and let me know if you use one. If so, is there a particular product that you would recommend? Zoya Charla is already one of my fave nail polishes! I was so happy to find Zoya's Sparkle collection in a random hair salon here in Ottawa. I usually have a hard time getting my paws on LE Zoya's. Charla is a beautiful mid blue shade with teal glitter finish. It applies beautifully and glows in the sun. I got tones of compliment on this in my office today. I was able to get it opaque in two coats. So far so good with my limited Zoya experience. I was more Zoya's! Only two more days till my 10-day vacation! I am so excited and also kinda annoyed that I've been working so much that I still haven't packed! I gotta do that today and also book a few more hotels. This is today's look when I woke up and felt like wearing bright pink lips that still looked office appropriate. Girl About Town was my first MAC lipstick and honestly still one of my faves. You gotta try it under Electric Fuchsia, makes a divine combo. Do any of your guys have this polish? What do you think of it? This month has been amazing in terms of successful swaps on Makeup Alley for me. I also picked up some items I've been eying for a while so I thought I post them all here. If you'd like any swatches or have questions about any of the products, please do let me know. 1. Essie polishes in Splash of Grenadine (swatch is here), Turquoise and Caicos (see here for swatch) and Lapis of Luxury. I also had the fourth polish included with this collex but gave it away to a friend. Need to pick it up soon again. The formula on these is hit and miss but the colours are gorgeous! 2. I was so thrilled to find Zoya's Sparkle in a random hair salon here in Ottawa. Normally we don't get many of Zoya's LE stuff in Canada, just some some boring reds and pinks. I obviousely took the opportunity to grab Charla and Gilda. I love these shades in the bottle and can't wait to wear them! 3. I got most of these items via swaps. Nars Cordura duo is quickly becoming my HG. I'm sure you're alreday tired of me talking about it, lol! This brown duo is ideal for every day looks as well as smoldering night out looks. Nars Scorching Sun is the perfect summer duo. It has an "orange juice shade" side and nice shimmery tangerine side. Both sides are very smooth and heavily pigmented. I swapped for Nars Maldives as I always wanted to try the multiples and this "pink Champagne with shimmer" shade was the most appealing to me. It looks great on top of your fave bronzer or blush or even on the lips. The last item in this pic is Nars Risky Business l/g which I first got as a mini but loved it so much that went and bought a full size. Risky Business is the perfect MLBB gloss. 4. Nars Laguana bronzer is a long time makeup artists' fave and I finally gave in and purchased it. I wear bronzer on my cheeks from April all the way till mid September and thought this was a good staple to add to my stash. I will add a full review of this and some other fave bronzers later on. 5. I know, I know, I got another Chanel item! I honestly had a really rough three weeks at work and needed something to cheer me up so I grabbed the last Genial RA at my Chanel counter. This is the most gorgeous bright pinky coral shade. I know I will wear this a lot this summer. I wore this to work today and got so many compliments, still have to post that FOTD too, lol! Too many blog ideas and too little time! Hope you guys enjoyed this post. If you have any of these products let me how you like them. I wore this look yesterday heading out for beers on a patio downtown with some friends of ours. It was an amazingly sunny day and I dressed accordingly with a miniskirt. I'm a big fan of dresses and skirts in general. I don't really like capris and pants on myself. I have what you may call a very feminine body type (an hourglass figure) so I just don't think pants suite me as much. Hence I'm always excited when warm weather is here and I can flaunt some legs, lol! I went for subtle brown smokey eyes with a pop here. I really can't stop using my Nars Cordura duo. Don't be shocked if you see it in this month's faves, lol! I also paired the whole thing with some red lips. Let me know what you think. Another one of Essie's Spring/Summer collection polishes is gracing my nails this weekend. Splash of Grenadine is a purpley pink and has a cream finish. This polish has a decent formula, it was not too thick or too thin and I got a great coverage with two coats. I think this particular shade is very flattering on my nails, I've got a bunch of compliments on my nails since I've spent most of the weekend out. I've been having a great weekend so far. I wore this look last night for a night out in town with one of my close girlfriends. We went to a nice pub, had a couple of Guinness and listened to live music. I'm not typically a pub kinda girl, I much prefer martini lounges. But I do somtimes enjoy the pub scenes and last night was one of those nights. I've been wanting to wear a gold and purple smokey look for a while and last night was the perfect occasion. I'm still in love with Goldilux by Sugarpill. If you don't have it you gotta take a look at it. These two are with flash and I think the colours look more vibrant. Hey guys and happy Saturday! I was contacted by the Ontario Provincial Office to assist them in spreading out the word on the importance of mammograms for women to keep breast cancer at the bay. They have given me the opportunity to give away 10 new tools called the "Thingamaboob". Then Thingamaboob visually shows women the various sized lumps that can be detected through regular mammograms to a physical exam by a healthcare professional to checking your breasts. Just to give you an idea, the average size lump that a regular mammogram can detect is about the size of an apple seed! Here’s a link to the site where you can actually see what it looks like and get more info about it http://www.thingamaboob.ca It’s really a great way for women to get the conversation started about a topic that they may not feel comfortable discussing at first. To enter the giveaway, simply comment on this post that you would like to win a thingamaboob. The giveaway is open to Ontario readers only and will stay open till June 1st. To learn more about the program and how to spread the word visit www.facebook.com/thingamaboob. Never before I've been this excited about a Friday! This Friday puts an end to a pretty terrible 4 weeks at work. I actually did a lil dance as I got home, lol! I'm off to the parents soon and will be going out with a girlfriend tomorrow. What's everyone doing this weekend? I did this red tones soft brown smokey look for today. I'm really digging the brown tones lately and I have a feeling some of my great latest finds (Nars Codrura and MAC Gold Stroke) have something to do with that. I'm also in LOVE with my mini Nars Risky Business l/g, aka the perfect MLBB lipgloss. I shall pick up a full sized one soon. lovely colour, poor formula. Still love it though! I did this look in the morning being inspired by the eyeshadows included with MAC's To the Beach collection. Now this collection is not being released until May 27 and my wishlist from it is pretty small but the eyeshadow colours included are very pretty. Most of them are perm though or I have dupes of them. Studio Sculpt NW25 - hate how SPF makes the foundation loook 5 shades too light, lol! For this edition of Thursday Poll, I wanted to ask you about your preference when it comes to loose vs pressed eyeshadows. When I first got into makeup (perhaps 9-10 years ago), I was all about pressed eyeshadows as I had no idea how to deal with pigments or loose eyeshadows. Nowadays, I have become pretty comfortable with my pigments and I would say I use them as much as my pressed colours if not more. I think I actually even prefer pigments as they are more versatile and also more vibrant (in most cases). My fave trick with all brands pigments is first to use them over a sticky base. Then I usually apply the pigment damp at first and layer a dry coat of the same pigment on top. Over to you, which of the two do you prefer? Or do you use both simultaneously like me? I honestly cannot wait for my vacation. I think I'm so exhausted that I'm actually more sensitive to little things now. Being away for a bit will do a lot of good. I was rushed this morning so I went for more neutral eyes and bright lips. Impassioned is such a gorgeous colour; I think it's my favourite MAC lipstick of the moment. I say of the moment coz honestly I have waaaay too many lipsticks to pick an all time fave, lol! Also, I like doing cat liner when I'm in a hurry. I'm fairly quick and precise with my liner and this look is always easy glam for me.